Founded in 1221 by Dominican monks in Italy, the Officina Profumo Farmaceutica di Santa Maria Novella remains one of the best kept secrets of the Renaissance city. It is tucked away behind one of the grandest frescoed monasteries in Florence, where its unassuming façade conceals one of the most ornate and ancient perfumeries in the world, with roots in the age of Pisano, Giotto and Dante. It was born out of the Dominican brethren’s humble production methods – they cultivated medicinal herbs in their gardens to create ointments and balms – and by 1381, the pharmacy was supplying the convent’s own small infirmary with custom-made medications. However, as the ordering of its name suggests (Profumo Farmaceutica), the monks weren’t all about medicine. One of the first products created using their traditional artisanal techniques and ancient apparatus was actually perfume: rose water. Made from the only hypoallergenic flower, rose water and pot-pourri were useful as an antiseptic to clean houses after an outbreak of plague, and both remain just as popular on the pharmacy shelves today, though fortunately for different reasons. Even now, the farmaceutica remains true to the made-in-Italy tradition established by the monks; everything is still created in-house, from herbs and flowers grown in its very own aroma garden, which sits hidden away in the hilltops just outside the city. Since 1848 customers have used the same Matteo Nigetti doorway as the entrance, a world away from the bustling crowds of the piazza Santa Maria Novella, off a side street on Via della Scala; if you don’t know where to look, you may miss it. Once inside, the impressive tiled entrance hall opens out into what was originally a chapel, now deconsecrated, with ornate frescoed ceilings of what are said to be the four continents. 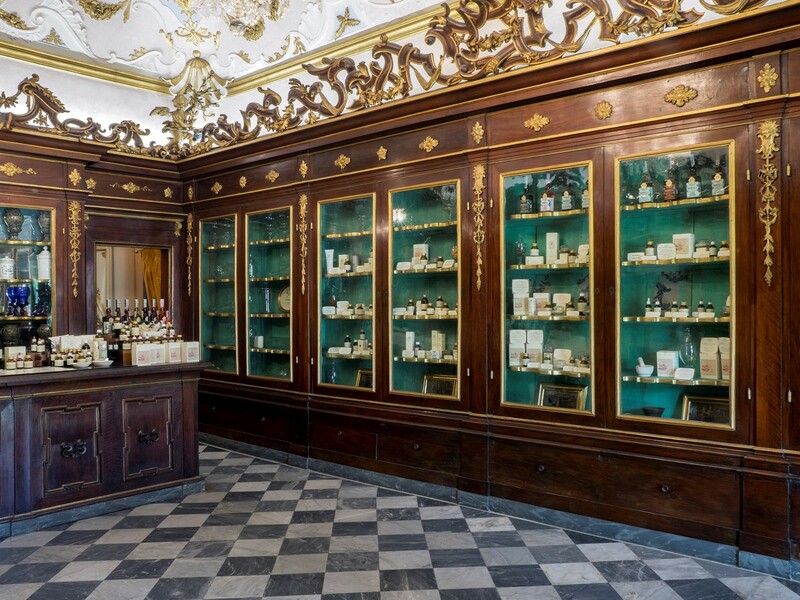 In the original pharmacy, which is now used as the sala vendetta, or sales room, cabinets and furnishings from 1600 and 1700 are filled with beautifully wrapped hand-crafted soaps, scents, and lotions that only add to the allure of this enchanted building. Walking inside you’re met by a wall of intoxicating floral scent, which comes as a welcome relief from the dusty Florentine streets. Walking deeper into the heart of the pharmacy, under ornate vaulted ceilings crowded with 18th century sphinxes, cherubs, fruits, and floral arrangements, it’s clear that this is no normal shop. Specialised rooms appear at every turn: one for household items, hand-dried pot-pourri, and candles, another for antica spezieria (ancient spices), dedicated to an exotic array of elixirs, edible items, and health supplements. 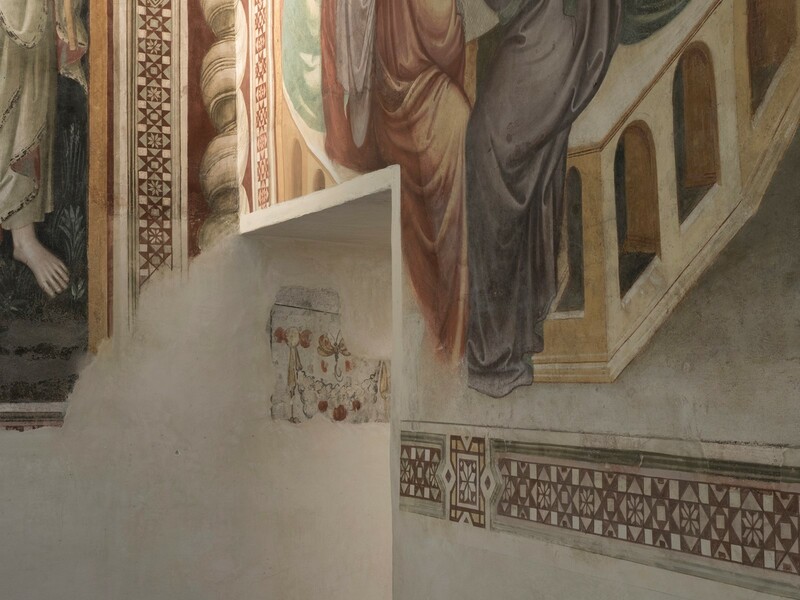 There’s also a tea room complete with private courtyard and blossoming orange trees, not to mention the farmaceutica’s own personal frescoed chapel. The heritage of this impressive boutique is instilled throughout the building: the simple apparatus originally used for distilling flower water and crushing petals remains resplendent in the tiled corridors of the museum; lists of ingredients and old packaging designs sit framed on white-washed walls; in la sala verde, the green room, elegant hand-painted pottery sits on gilded shelves with vessels commissioned from the craftsmen of Montelupo during the 18th century. 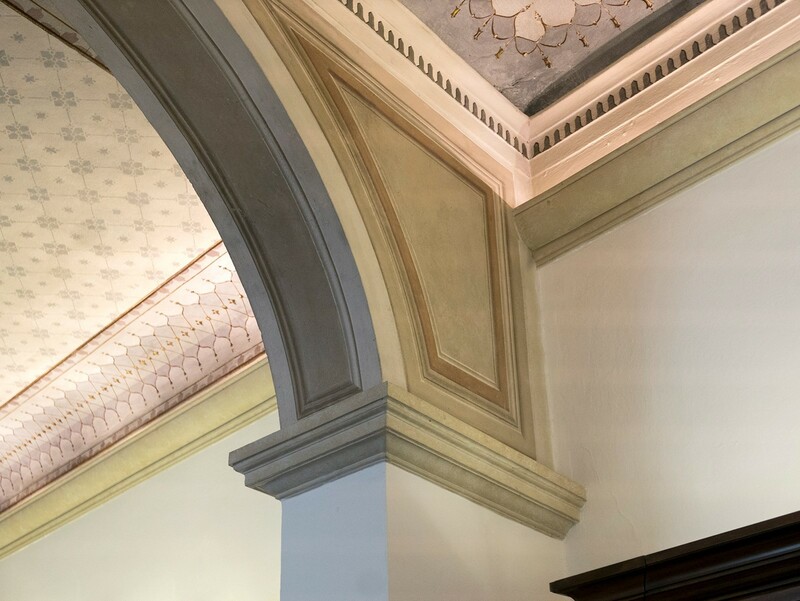 These decorated walls are also home to a series of framed gold portraits which depict past directors of the farmaceutica, spanning back to the opening of the Officina Profumo to the public in 1612. With a beginning this opulent, it serves to follow that when the 14 year-old Catherine de’ Medici desired a signature scent, she turned to the pharmacy to produce her Acqua della Regina with Calabrian bergamot to take with her to France. As time progressed and the demand for more luxurious products increased, the monks set about creating new fragrances, powders and rouges. 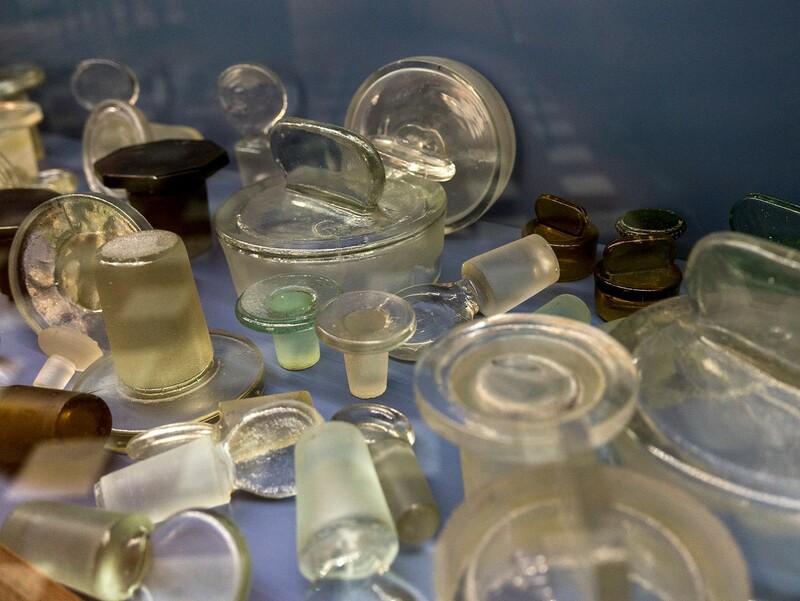 The 1850s to the 1900s saw everything from the introduction of lavender smelling salts to decorative boxes for Velutina soap, Iris scented powders and herbal lozenges. Their adherence to tradition twinned with innovation and modern machinery continues to this day to give Santa Maria Novella its edge. Although it may not be entirely run by monks today, its roots and heritage remain a crucial ingredient in every product. Modern machinery may have taken over, but the recipes remain the same, the ingredients still hand-plucked from Florentine fields. This beautiful establishment lives up to its royal visitors, including the likes of Alfonso and Isabella d’Este, Lucrezia Borgia, and Catherine and Cosimo de’ Medici, and although it continues to serve bonafide princesses, today you’re more likely to rub shoulders with a different kind of royalty: Angelia Jolie, or the Olsen twins for example. Just walking into these lush surroundings – with gilded angels on plinths looking down from cornices, gold-embossed patterning, mosaics, and hand painted frescoes wherever you glance – you’ll feel a little bit more royal yourself. For more information, or to visit the Officina Profumo Farmaceutica di Santa Maria Novella, visit the website.